If a client used job details or categories in their MYOB / Quickbooks /Reckon / Sage file they come across in our conversions as tracking categories. This means that more detailed historical information is preserved for reporting and business analysis. How do I make sure the jobs/categories are coming into Xero? As long as there are les than 500 Jobs / Classes / Categories in your file then there is nothing you need to do, our conversion software automatically checks whether jobs and categories have been used in MYOB / Quickbooks /Reckon / Sage . If so, it creates a tracking category called job or category in Xero. Each job/category is created as an option, so that they are accessible for future transactions. How are the options named? We use the job/category names from MYOB / Quickbooks /Reckon / Sage. Descriptions do not come across as they are often too long to be useful. Equally job codes are mostly too short to mean much. What if my client wants to use different tracking in Xero? 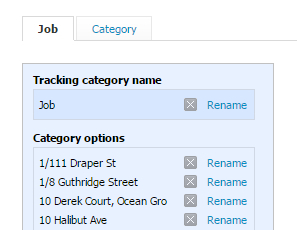 This is really easy to achieve by archiving the job/category tracking categories and setting up the new tracking you want to use. Please note that we convert into tracking categories and not ‘Projects’. What about jobs that have started before the conversion date? We are not migrating job/category opening balances. The tracking only commences at conversion date. You are able to add manual journals to add these opening balances if this is essential for you. Or you might want to choose an earlier conversion date so that the relevant job details are in Xero. How is tracking applied during the conversion? Categories are per transaction in MYOB / Quickbooks /Reckon / Sage where Xero tracking is by transaction line. How does that work? Any transaction line that we migrate to Xero gets the correct tracking option applied to it. Where categories are used in MYOB, we just assign a category to each transaction line in that transaction. Do I have to do anything to run job tracking reports? As soon as you receive your Xero org you can run Profit & Loss, Balance Sheet and Tracking Summary reports by any job/category. How do Header jobs convert? Note that Xero has recommended limit of 100 Tracking Options in the P&L and other reports. The conversion will bring in up to 500 Jobs / Classes / Category codes. If you have more than 500 then the transactions will still convert but without the corresponding Jobs / Classes / Categories. As always, please let us know if you have any other suggestions to make the conversion experience even better for you.